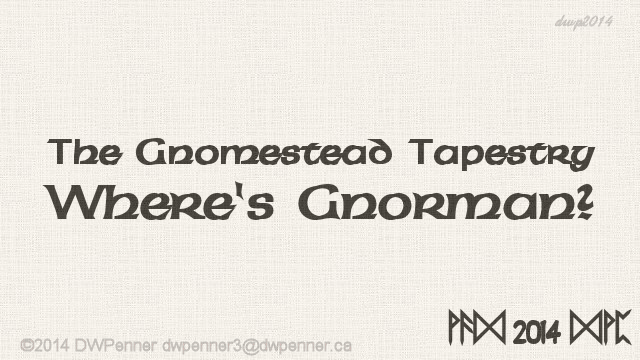 A Gnomestead Tapestry Anniversary Special. This is a tournament for fighters fighting on foot. It is held just outside the city. Have fun finding Gnorman! He’s in there somewhere… but there are also other gnomes. I hope you enjoyed this anniversary special! For our 1st anniversary I thought I’d post another “Where’s Gnorman?” special. The solution will be posted on Monday, October 20, 2014. I hope you enjoyed the puzzle! For our 1st anniversary I thought I’d post another “Where’s Gnorman?” special. At this time the Kingdom is holding one of their tournaments. For this tournament the combatants will be on foot. They use special non-lethal weapons as this is all in sport. One year ago I started “The Gnome Tapestry”. I decided to do a special “Where’s Gnorman?” to mark the occasion. Clicking on the image will bring you the full-sized image. But be warned it is 18MB in size. In this past year I’ve posted over 200 posts! Here’s looking to the upcoming year! This is the South Cringle Archduchies keep; inside the walled city. Have fun finding Gnorman! He’s in there somewhere… but there are also other gnomes.